It’s spring and while I say it every year, it is definitely true – teachers and staff look forward to the break from school more than the kids do. I, amazingly, finished almost all of the IEPs and meetings, completed my reevaluations and managed to get caught up on most everything. Just in time for testing season to begin. I think I’m testing between 24 and 28 days over six weeks. Sigh. We decided to stay home this week in part because we couldn’t agree where to go, or where we wanted to go was cold, and because Bob just doesn’t have the time off. So I’m hanging around the house and prepping for my certification exam on Friday. Yes, I have to take a test. Despite my 200 hours of inservice points and everything else I have to renew my certification, I have to take a content area test. I won’t go into details but I am not happy about this as it was the fault of the district and some incorrect information (or they just changed their minds again). I am not happy about having to do this, but it should be fine – I got a 90-something on the practice test. I am brushing up on Geography and Ancient History. Not my favorite subjects. But as I study this week I have some very cute furry creatures to keep me company. The kitties have been hanging around the house lately. Even Gracie has not ventured too far. We think it is because of the neighborhood cats that have been hanging around. Whatever it is I am very happy to not be woken up at 2 am when she decides to come home. Now she just wakes me up at 3 for cuddles. Jessie looks pretty good for an 11 year old dog. 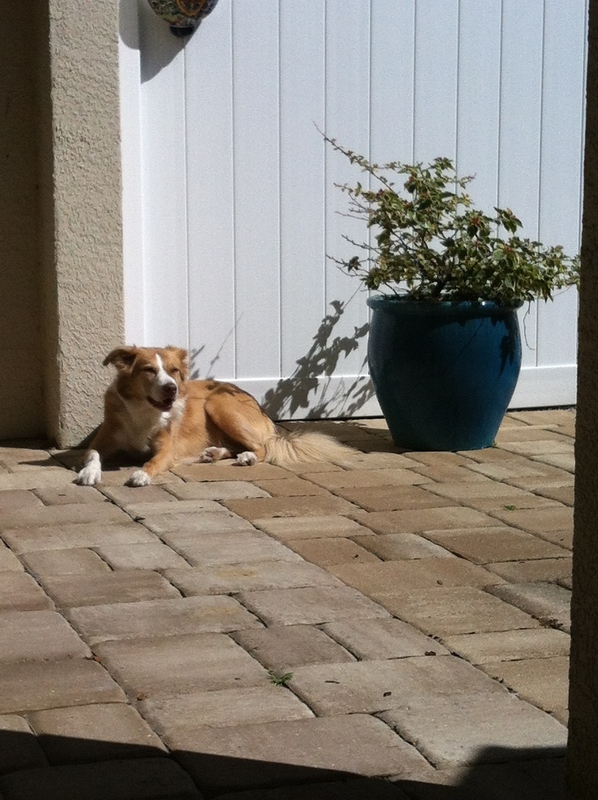 She still loves her walks and she adores laying in the sun. The last few days have been too rainy for her to go outside but she will go as often as she can. 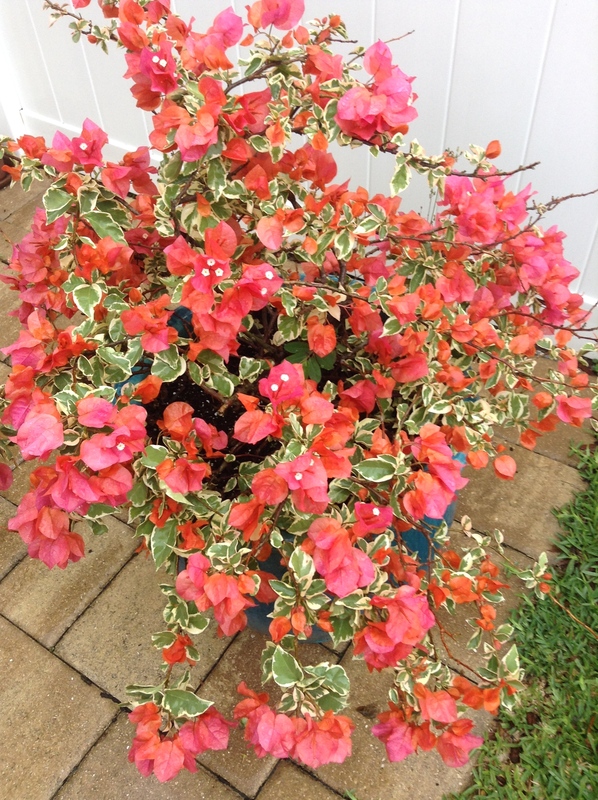 As you can probably tell from the plant, that was taken a few weeks ago – the bougainvillea has way more flowers on it now! It likes the backyard and the pot apparently. I love this plant. I loved it the first time I saw it at the nursery. The leaves, the flowers, the color. I had almost given up on it when we moved it to the back. It makes me so happy to see it blooming so fully. 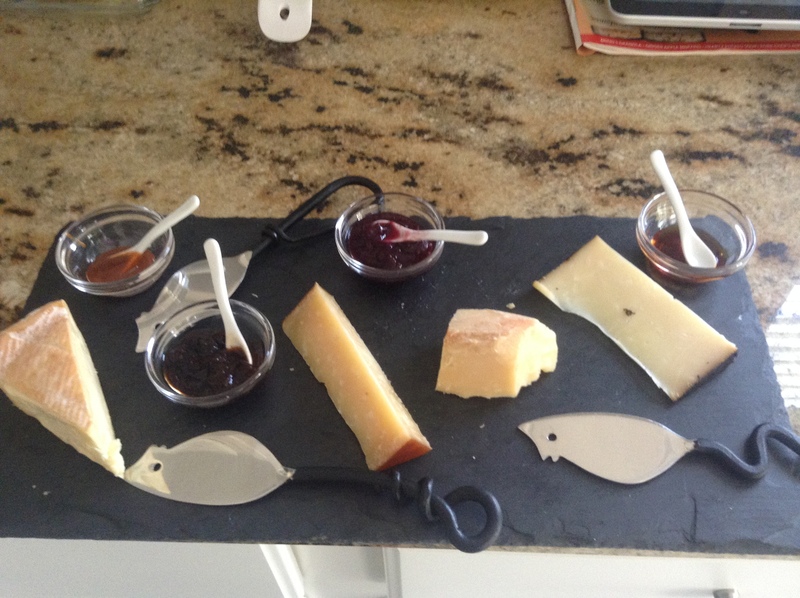 Bob and I did start my vacation right – we did a cheese class at our favorite cheese shop. Yes, we talk about this place a lot, and we are slightly obsessed with good cheese (although in all fairness I’m obsessed with good food, not just good cheese). But cheese is a simple food and the variety is amazing and it just tastes so good (and pairs really well with some wine) that its hard not to love. Well, for me at least. This cheese class focused on American Cheeses. Not American Cheese or, as much as it pains me to admit that I like it on occasion, cheese product, but real Artisan Cheeses produced right here in the USA. As much as I get into local food movements and knowing where your food comes from, I was surprised at the range of American cheeses. Pleasantly so. We went through ten cheeses from very soft fresh cheese to the I won’t eat it but Bob loves it blue. 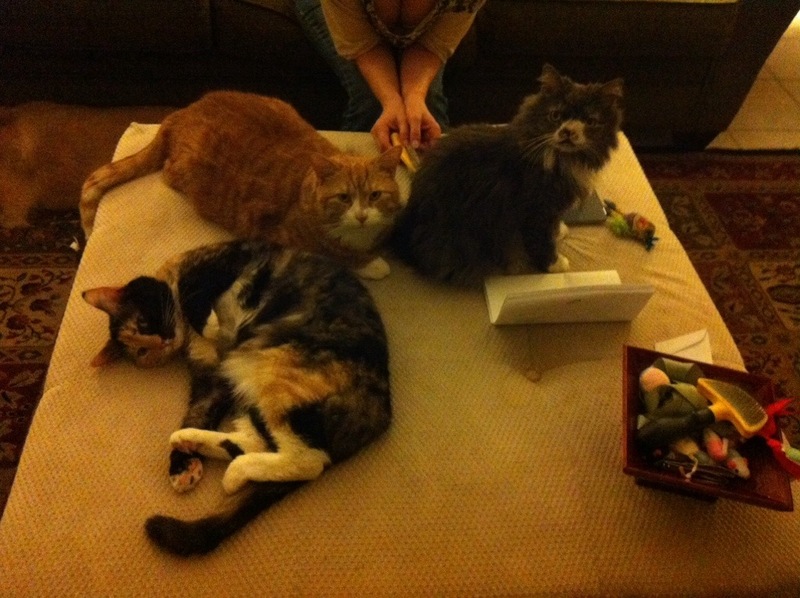 We found lots to love, but narrowed our take home choices to three. 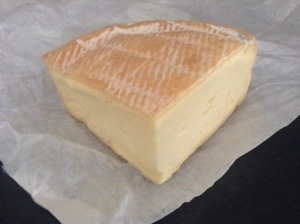 This cheese is from Vermont and the Von Trapp (yes, those Von Trapps apparently) Farmstead. This is the cheese Val gushed over at Christmas and it is still that good. I was surprised when the lady sitting next to me took only one bite of this one – it is really just about a perfect cheese. Mild in flavor, great texture, but with enough character to let you know you are eating real food. I almost asked if I could have the rest of hers, but I thought that might be a little rude. And last, but not least was this one. 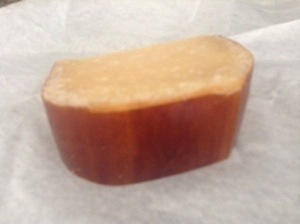 This is a Utah cheese (who knew) that is rubbed in espresso and lavender. Barely Buzzed is its name and it is really hard to describe. 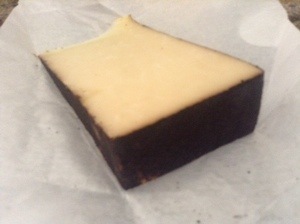 Obviously if you eat the rind area you get coffee – lots and lots of coffee, but as you eat into the cheese you get more lavender and more put cheese taste. Again, I can’t really compare it with anything else, it is unique. I did make the chicken pie the other week, but forgot to take pictures. It wasn’t too pretty either. I’ve been doing some cooking, but nothing terribly exciting. Bob is putting up with my vegetarian experiments or tried and true veggie dishes and I occasionally reward him with BBQ chicken or sausages. I’m pretty sure the food portion of this blog is going to be in a sorry state for the next few weeks, but hopefully I can get one interesting dish in before the end of the school year. I also hope to have a few minor adventures to share – we are doing the Wine Walk at the Ca’dzn mansion this week, so if I can get a few pictures I’ll make sure to post them. All in all life is pretty much the same here, and that is pretty darn good. Hope everyone is making through the (hopefully) last snow storm of the season.